This is a non-commercial, no-vendor event. NO PETS unless it is a legal, licensed service animal wearing an authorized vest. The venue is handicapped-accessible and wheelchair-friendly; the entire area has wide walkways and maneuverability. There are 3 metal park tables and 3 benches. It would be a good idea to bring your own chairs or blankets to sit on since seating is limited. 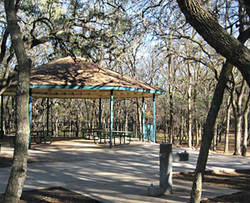 Alcohol and glass containers prohibited by city park rules. There is a really nice soft-floored climbing playground attached to the pavilion. Parents are encouraged to bring outside games to share with others, so our children can play together. The location is free as long as there is no live music or alcohol, so please don't bring drums or other musical instruments along. Discussion forum is the SAPO Facebook group.